Congrats to Linda, who won a copy of SCANDAL IN SKIBBEREEN by guest author Sheila Connolly! 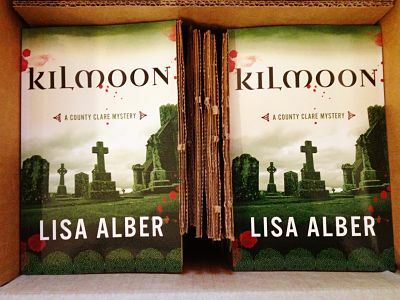 Lisa Alber received a box of books, beautiful books! Behold, KILMOON! Susan Gloss is honored that VINTAGE has been selected as a “Midwest Connections” spring pick by the Midwest Independent Booksellers’ Association (MIBA). She’ll be attending MIBA’s conference in Iowa City on March 12! Natalia Sylvester went to her first Association of Writers & Writing Programs (AWP) conference this week, which she’s now convinced is like a theme park for writers. She had a blast meeting writers she’d previously only known online, learning more about writing and the industry at the insightful panels she attended, and serendipitously running into amazing people like Heather’s agent at a bar! Bonus excitement: she just learned she and Heather will be speaking on a panel together at DFWcon in May! Heather Webb attended a wonderful indie bookstore’s grand opening event with the likes of 8 other local authors including Wally Lamb and Barbara McClintock. She nibbled on the cafe’s French pastries, spotted a large stack of BECOMING JOSEPHINE in full display, and even scored a free UConn Co-op Bookstore t-shirt.